The origins of the Wise County Heritage Museum trace back to a meeting in1891 of the Northwest Texas Baptist Association that founded the Northwest Texas Baptist College, a four-year institution in Decatur. The first classes were held in the Cates Opera House located on East Main Street- just east of the town square. Land for this site was purchased through real estate agent C. D. Cates of Decatur. Twenty local Wise County men pledged $1,000 each (plus other smaller pledges and donations from other individuals) to guarantee the debts of the new school. Thus this building was constructed. The architect was W. A. Cann Architectural Co. of Wichita Falls, Texas. Construction contract was awarded in February, 1892, to S. C. Kilgore of Denison in the amount of $20,855 with construction to be completed by September. Construction began, but a contract was relet to Ferrier Bros. and Wirz of Seymour in May of 1892 in the amount of $24,575 to be completed "at once". The new building was opened for the fall semester of 1893. The institution's first president was Dr. A. J. Emerson who served for four years until the school went bankrupt in 1896 and the creditors looked to the guarantors for payment of the outstanding debts.. 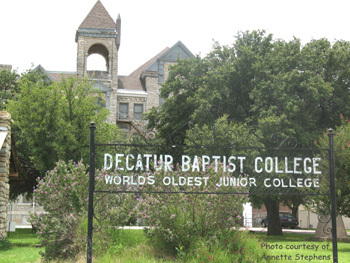 The following year, the Texas Baptist Convention bought the property and formed Decatur Baptist College-the first planned junior college in the world. DBC was a preparatory school for Baylor University in Waco and taught many young people in preparing for church service along with other areas of study.. Dr. J.L. Ward served as President of DBC for 2 separate terms totaling 44 years. The last president of Decatur Baptist College was Dr. Otis Strickland. After over 67 years in Decatur, the school was moved to Dallas in 1965 where it is now Dallas Baptist University. After the school moved to Dallas, a local businessman, Coke L. Gage, purchased the entire Decatur Campus in hopes of bringing another college to the town. When this failed, he donated the former Administration building and just over one acre of land to the Wise County Historical Society, Inc. to be used as a county museum. It now houses one of the best family research facilities in the area plus the museum exhibits and an auditorium. Restoration of the building has been ongoing since 1967. There have been many fund raising activities through the years, some of which are: the annual Wise County Fall Out talent show, our monthly Gospel Opry program, and an annual Ron Hammer Gospel Concert. These activities along with the generous support of many former DBC/DBU students and faculty members and many other folks with ties to Wise County have helped us get to where we are today. Today, the museum is alive with the activity of preserving Wise County's past. It is the headquarters for the Wise County Historical Society, Inc. and the Wise County Historical Commission. 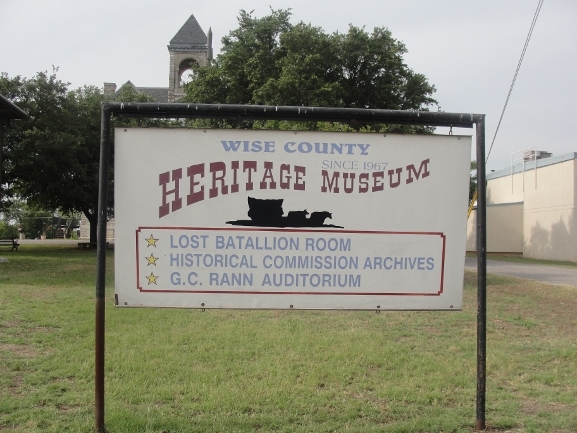 Together, these organizations help to educate citizens and visitors about Wise County history, DBC history, and the history of the Lost Battalion through museum exhibits, presentations, and our archive collections. Members attend conferences to study and work to keep the exhibits and archives updated. The Museum is kept in operation through fund raising activities, generous donations, admissions fees, sales from the gift shop, assistance from Wise County, and income from archive research activities. Past renovation of the building have included: adding a ramp, hand rails, and elevator to make the building accessible to the physically challenged (elevator is inspected annually); reworking the rock on the exterior; replacing the exterior windows to improve building's appearance, security, and environment; adding new restrooms, a security system, sidewalks, outside lighting, new/replaced electrical wiring, interior lighting, ceiling fans, air conditioning and heating units, auditorium sound system, stage curtains, carpeting, office equipment, filing cabinets and shelving, computer systems, microfilm processing equipment, etc. The ceiling of the auditorium area has been replaced and the walls in the auditorium and backstage repaired. The railing of the auditorium balconies has been raised for safety which allows for overflow seating there during productions in the auditorium. The rafters in the southwest corner of the roof had to be repaired after a tornado raised the roof and pulled the rafters loose from their splicing. A corner of the bell tower had to be rebuilt after it fell down due to a lightning strike or vibrations from nearby well drilling. A complete new roof was installed a few years back along with guttering and down spouts. Almost anything that did not move has been repainted-inside and outside. The basement has been cleaned out and a sump pump installed to handle incoming water after extended rainy times. The building's plumbing has been recently reworked. Much has been accomplished but, with a building that is over 120 years old, something is always needing to be done. Our Exhibits include: our first floor family archive library and research/reading room; an 1890's funeral coach; fossil exhibits; household furnishings and picture gallery; DBC exhibits; mercantile room; and tool/machinery room. On the second floor we have our auditorium and dressing room area plus our Lost Battalion Room. On the third floor is our fire fighting exhibit; Sam Sampler military room; one room school house area; a general store; dairy equipment; train display; courthouse area; and sewing room area. Outside, we have an antique farm equipment display on the west side of the building and the restored Woody Cabin in the front lawn. Two of our greatest exhibits are the Woody Cabin and our Lost Battalion Room. The Woody Cabin was moved from its original location on Deep Creek to the front lawn of the museum. It was originally built in the 1850's and is about the oldest structure built in Wise County. It can be opened for tours during museum hours but is often the subject of pictures at any time. Our Lost Battalion Room honors the memories and great sacrifices of the men of the 131st Field Artillery, Second Battalion and the survivors of the Cruiser, USS Houston (CA30). These Soldiers (many from our area) were captured by the Japanese and held in forced labor camps for three and one half years where they were tortured and starved. Many of these men built the railroad, using only hard labor and hand tools, through the jungle leading to the bridge over the River Kwai. Some of the survivors from our area helped to build and set up this display.